Annabelle's Serpentine Dance (1895). William Heise filmed this movie for the Edison Manufacturing Company. Tinting gives it emotion. On the left, tint applied globally gives the space the look of molten blue glass. A second layer of color applied by hand turns the dancer into a jinni. 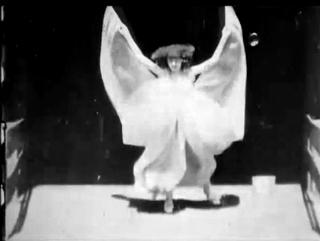 The same frames, untinted on the right, render the dancer abstractly. "The fairy girl dancing" cast her wiles well into the twentieth century. Published in Princess Mary's Gift Book (1917), illustrations by Claude Arthur Shepperson for Alfred Noyes' poem "A Spell for a Fairy" inspired the Cottingley Fairy Hoax of 1919. 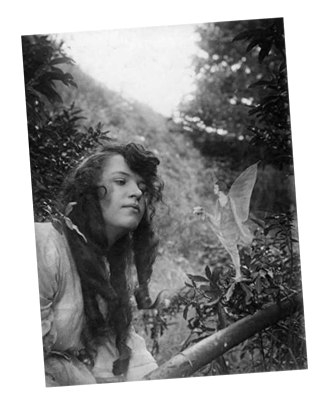 Two British girls contrived five"fairy photographs" from cardboard copies of Shepperson's drawings superimposed on glass plate photos.